With an ability to hop across borders and exploit weak spots in the four countries surrounding Lake Chad, Boko Haram took advantage of a divided region to gain strength. The affected countries decided there was only one way to tackle this problem: Join forces. The result was the Multinational Joint Task Force (MNJTF), a 10,500-person regional military effort designed to stamp out Boko Haram once and for all. The MNJTF was established by the Lake Chad Basin Commission (LCBC) in 1998 to fight highway banditry and other cross-border crime. It was reactivated in 2014 and authorized by the African Union to conduct combat operations against Boko Haram, intercept trafficked weapons, liberate hostages and encourage defections. It became operational in 2015 but did not conduct its first mission until 2016. Four LCBC member states — Cameroon, Chad, Niger and Nigeria — as well as Benin contribute troops. Each of the four countries surrounding the lake has a regional headquarters, and the mission headquarters is in N’Djamena, Chad. The task force has had false starts and setbacks, not the least of which is a $700 million budget without a reliable funding source. But observers are encouraged by what it represents: a true African solution to an African security problem. The first hard evidence of the task force’s strategy came in the summer of 2016 with Operation Gama Aiki, or “Finish the Job,” in the Hausa language of northern Nigeria. The coalition began striking Boko Haram strongholds around the Lake Chad basin. From the north and northwest of the lake, Chadian and Nigerien forces, backed by combat helicopters, hit Boko Haram enclaves. Their goal was to wipe out bases on Niger’s side of the border and cross over to Nigeria to liberate the area near the Yobe River, which had become a launching pad for attacks. At the same time, Nigerian forces moved north along the Cameroonian border, pushing Boko Haram militants into the Sambisa Forest. To the east, 2,500 Cameroonian forces left the town of Makari, crossed into Nigeria, and attacked a Boko Haram base near the town of Saguir. In all, it was an impressive effort coordinated from the N’Djamena headquarters. According to the MNJTF, during the first five months of 2016, the task force freed 4,690 Boko Haram-held hostages, “neutralized” 675 Boko Haram members, arrested 566 members and dismantled 32 camps. In October 2016, 240 alleged Boko Haram members and their families surrendered to MNJTF forces in Baga-Sola, Chad, after efforts to block Boko Haram supply routes and isolate its strongholds. The MNJTF structure is complex by necessity. It requires the legitimacy of multinational organizations but also must have the buy-in of individual heads of state and military commanders who do not want to cede authority on major decisions. It is a delicate balance. If any of these stakeholders are left out, the project could fall apart. The civilian head of the task force is the executive secretary of the LCBC. He directs the day-to-day political, strategic and operational actions of the mission. The MNJTF also relies on an AU “mission support team,” which offers technical assistance and coordinates partner support. Military operations are overseen by a force commander based in N’Djamena, who, according to unanimous agreement, is Nigerian. Finally, the four sector commanders and civilian and military leaders of individual countries have wide latitude as to what operations they will and will not authorize. 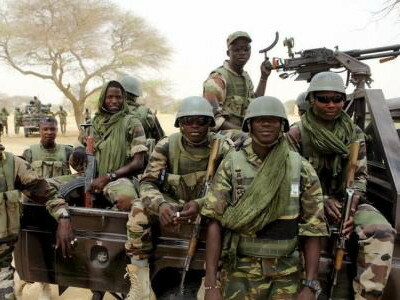 According to the Institute for Security Studies (ISS), the task force should be viewed as a “framework for coordinating actions in order to obtain a multiplier effect.” The MNJTF is not intended to supersede national efforts of the four Lake Chad countries or even bilateral efforts against Boko Haram. A historical mistrust between military and political leaders exists in West Africa as it does in many other parts of the world. Cameroon and Nigeria, for example, have feuded over borders for decades. Some of this hostility hampered the task force at the beginning. Nigeria was vocal about not wanting foreign armies to encroach on its territory in pursuit of Boko Haram. According to Heungoup, requests by Cameroon and Nigeria to cross borders in pursuit of Boko Haram were regularly refused in 2013 and 2014. A major event that helped change this was the election of Nigerian President Muhammadu Buhari in May 2015. He voiced strong support for the MNJTF and, between June and August 2015, visited the heads of state of the other four task force countries to reaffirm his commitment. “Buhari brought new impetus to the joint response efforts, as illustrated both by his commitment to contribute up to $100 million to establishing the MNJTF and his decision to take on its leadership,” wrote William Assanvo and co-authors in an ISS report on the task force. The MNJTF cooperation model has evolved. Although it does not typically include mixed units or joint missions, it does include the right of pursuit across borders, generally to a distance of 25 kilometers, and a significant amount of information sharing. An example of this cooperation is Operation Arrow Five, a raid on the village of Ngoshe, Nigeria, by the Cameroonian Armed Forces in February 2016. Located 20 kilometers from the Cameroonian border, Ngoshe was a Boko Haram stronghold and served as a manufacturing plant for improvised explosive devices and land mines. With help from Nigerian intelligence, Cameroonian forces liberated the town and killed 162 Boko Haram fighters. Nigerian forces prevented a retreat by fleeing terrorists. Although the shared responsibility is a strength of the task force, some observers have noted that it allows a sort of diffusion of responsibility. Since not all militaries are equally strong or well-equipped, Boko Haram seeks out weak spots. According to the Institute for Defense Analyses (IDA), after Boko Haram attacked a Nigerien base in 2016 and killed 32 Soldiers, Niger was forced to request assistance from Chad, which took about a month to arrive. There is also evidence that since 2015 the group has given up on holding territory and has shifted to asymmetric tactics. The task force is viewed as a response to a serious problem that did not rely heavily on outside assistance from Western countries or from the African Union. The AU provided some communications equipment, vehicles and generators while the European Union pledged 50 million euros. The MNJTF was created out of a coalition of willing countries and has built its strategy on the fly. Experts, including Cedric de Coning of South Africa, have argued for this type of ad hoc solution that is quickly developed to counter a specific threat. The ad hoc model would replace the old model of standby forces and predetermined coalitions. De Coning said this is needed in Africa, where coalitions must be based on national interest and capabilities. Heungoup said other regions should take heart in the success of the MNJTF but shouldn’t assume it can be copied elsewhere. It worked in the Lake Chad basin because several of the countries involved had well-trained, battle-tested militaries. This is not the case in every region of the continent. It also worked because the seriousness and immediacy of the crisis demanded a swift response. It was not something that could be put off or delayed in the hopes it would solve itself.